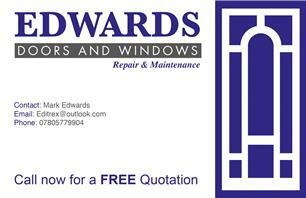 Edwards Windows & Doors - Fascia/Soffits/Guttering, Windows/Doors/Conservatories based in Birmingham, West Midlands. Windows – big ones, small ones, round ones, square ones … whatever shape or size you require Edwards Windows & Doors can supply and fit them! And we have doors to open and close in every style you can imagine! The profile of frames we use are reinforced UPVC supplied by The Flair Collection – this may not mean much to you but we are confident in the quality and durability of the materials we use. The double glazed units we use are Plamitherm A Rated Argon filled Units as standard with sculpurted edge finish – again we can assure you we only use the very best products. New windows and doors can transform your home with the added bonus of security and energy saving. A new conservatory adds an extra living space to your home that you can enjoy all year round and UPVC soffits, fascias, boarding and guttering help protect your home from the weather and are practically maintenance free. UPVC and Aluminium – we love it! If you have any questions at all, please call us.